This cross-section view shows the Visible Human Male (left), who debuted in 1994, and the Female (right), released in 1995. If something has been used regularly for 20 years, you might expect it to show signs of aging. Not so for the Visible Human Project. The National Library of Medicine (NLM) introduced the Visible Human Project (VHP) in November 1994 and in doing so revolutionized our ability to view and understand human anatomy. NLM’s Michael Ackerman, PhD, a biomedical engineer, came up with the idea for the visible humans in the 1980s, at a time when the library’s long range plan included a recommendation to investigate the feasibility of a biomedical images library. The VHP is a library of digital images representing the complete anatomy of a man and a woman. NLM funded researchers at the University of Colorado Health Sciences Center to create the images. Two cadavers were imaged from head to toe using computed tomography, magnetic resonance, and x-rays. Then, the cadavers were frozen, milled a thin layer at a time, and digitally photographed. Thousands of people worldwide have licensed the image dataset, free of charge, to study or create all kinds of things—artwork, prosthetics, educational materials, and surgical simulators, for example. At the 20-year mark, NLM in Focus spoke with Dr. Ackerman about this prolific project. Q. Can you briefly describe the origins of the Visible Human Project? A. It’s very simple. My job, when I came to NLM in February of ’87, was to go around the country and let people know how they could use PCs to teach medicine. People at med schools seemed to be excited about it, but the technical maturity wasn’t there. Remember, this was pre-networks. Back then, we stored image information on 12-inch videodisks. One of my talks was at the University of Washington in Seattle. I did a demo and then the chair of Biological Structure, Cornelius Rosse, said the words that in effect launched the Visible Human Project. 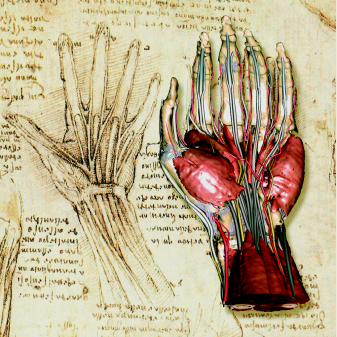 “If you want to use a PC to teach medicine, use it to teach anatomy.” Wow. As I continued traveling, I saw that some medical schools were starting to image different parts of the body, like the brain, the foot, and the head, but nobody was taking on the entire human body. That’s what I thought NLM’s role should be. Alvy Ray Smith, a co-founder of Pixar, was persuaded that the whole thing would work. [Smith was among the NLM advisors reviewing the project]. Even though the technology and the data handling capacity wasn’t up to the challenge—the CD, with 700 megabytes of storage, wasn’t yet available, so all there was for movable storage was the floppy disk, with 1.4 megabytes. Alvy Ray, who was considered an expert and was really respected, said that by the time NLM did the project, the technology would have caught up. And he was right. We went through the process of selecting the University of Colorado to do the processing and also identified our male and female subjects. We announced the completion of the Visible Human Male in November 1994 at the RSNA [Radiological Society of North America] meeting in Chicago. We thought it might be of interest to that group but probably few other people. By 5:00 that day, we had the 1990’s equivalent of going viral. Our voicemail box was completely full with press calls, which eventually led to a CNN piece and a great 30-second spot on “The CBS Evening News,” reported by co-anchor Connie Chung. By the way, we introduced the Visible Human Female at the RSNA meeting in November 1995. Q. What did you and the other visionary creators see as the VHP’s possibilities? A. In hindsight, we had kind of a limited view. Of course, as intended, we thought medical schools would use it for medical education. We thought doctors could use it for patient education, like, “Here’s your problem,” manipulating the images to look like a particular patient’s body. We thought the Visible Humans might put medical illustrators out of business, but it’s done just the opposite. Human anatomy is so complicated, this has turned out to be a really useful tool for medical illustrators, as models for their illustrations. We knew this was the case when Johns Hopkins gave [NLM Director] Don Lindberg and me their highest award for service to the medical illustration profession. It’s amazing to me that we’re still getting two or three requests for the data each week. Wow! I can’t understand it. That comes out to about 200 a year, 20 years out. Of course, human anatomy doesn’t change through time and our data is always reliable. So far, we’re at close to 4,000 licenses and counting. Q. In your view, what are some of the more interesting applications? A. Someone applied to use the data to create virtual crash test dummies. We’re not sure that ever happened—we haven’t seen a paper on it or anything. But it’s a great idea. Alexander Tsiaras, a New York artist, created some really interesting images from the Visible Human data. Some of these were featured in LIFE magazine, and he’s made holograms and done other things. His work is more modern. Someone developed a mannequin based on Visible Human data. It was a virtual patient, created so that doctors could practice endoscopies. When we needed someone to demonstrate it at a Board of Regents meeting, we asked [renowned heart surgeon] Dr. [Michael] DeBakey [also a long-time NLM advisor] to give it a shot. He was pleased to do so, but he had one complaint. He said the sensation of performing an endoscopy was just right, but the problem was that the patient was too compliant. He didn’t move around. We knew then that we had his seal of approval! One that surprised us was an installation at the University of Colorado-Denver, in the Health Sciences Library. It’s an artwork made up of many stainless steel strips, filling a circular area three stories tall. Rae Douglass is the artist. When you view the strips from any direction, you see the 3D Visible Human. Q. How does it feel to be one of the founders of this project? A. When Alexander [Tsiaras] put together a show of his work for the Science Center in Baltimore, I went to see it. Nobody knew who I was but when I heard parents explaining to their kids how the body worked or what organ that was or that this is where Grandma’s health problem was—I felt the way a composer of a great piece of music must feel, hearing all the applause from the back of the hall, anonymously. They love it! Bravo! That is something. Q. What is the legacy of the Visible Human Project? A. It’s terribly exciting to think that something created for medical students took on a life of its own and exploded. It’s still serving well today. The only way we could make it better would be to produce the data at a much higher resolution. We shall see. December 31, 2014 in Products.